UEM vs. ITAM – What’s the Difference? In 1996, Washington, DC and its surrounding communities were hit with a tremendous snow storm causing businesses to shut down across the entire region. Today, advances in technology allow people to work from almost anywhere, eliminating “snow day” shutdowns for most office workers. Mobility solutions, cloud solutions, and light weight laptops have given employees access to the tools they need to do their jobs from almost any location. However, today’s technology advancements are straining IT departments as they try to support various IT solutions across multiple platforms. Demands on IT administrators will not slow down this year as most organizations are driving their digital transformation strategy to keep up with competitors and customer demands. To achieve digital transformation, organizations are implementing Unified Endpoint Management (UEM) solutions along with IT Asset Management (ITAM) solutions. Although both strategies are focused on IT assets, their objectives are not the same. What’s the difference? To support IT assets, IT administrators have to maintain and configure devices to use VPN services, email services, and connectivity services such as Wi-Fi. However, maintaining devices requires administrators to enforce access policies, install updates, control applications, deploy and manage legacy applications, enforce encryption, manage printers, and to perform audits. The challenge faced by administrators is to perform these tasks across a diverse environment with multiple platforms and operating systems. The objective of UEM is to simplify the process of managing a diverse set of IT assets through a single interface. UEM solutions are vital for IT departments trying to manage the influx of IT assets coming on to the network. Without a UEM solution, IT administrators would have to learn and understand multiple tools in order to complete a single task. For this reason, many organizations are turning to UEM solutions as a way to deploy, manage, and a secure their IT assets across multiple platforms. Because IT assets need to be discovered and documented into the UEM solution, discovery tools are essential. UEM discovery tools work across multiple platforms and operating systems. UEM solutions need to secure the IT assets they manage. To secure IT assets, UEM solutions ensure that applications are kept up to date, that proper security controls are installed, and that policies are applied. Integration is a key component for UEM solutions. This gives administrators the ability to see and manage all IT assets from a single console, thus eliminating endpoint silos. Without integration, administrators would be required to learn and use multiple management interfaces to manage IT assets across platforms. When UEM solutions are integrated with other solutions on the network, automation can drastically reduce overhead by automating tasks that are typically performed by a human. For example, when a new employee comes on to the network, a UEM automated task could be triggered by a Human Resource (HR) application to automatically deliver software packages required for the new employee. It is important to note that Process Automation is a key component of digital transformation. Ashish Deshpande writes about this on Forbes.com: "Ultimately, people — not technology — drive change. When your people aren’t wasting time on non-core activities or manual workarounds, they can do more of what’s important." An IT asset refers to both hardware and software used to support an organization’s business objectives. IT Asset Management (ITAM) provides standards, processes, policies, and measurements for the purpose of increasing IT asset control and compliance in addition to reducing risk and costs. Ultimately, ITAM provides organizations with accurate inventory reports. With accurate inventory reports, organizations are able to make informed IT purchase decisions. The challenge with managing IT assets is that IT assets are often updated, moved, and refreshed, which makes it difficult to maintain up to date asset information. Inaccurate IT asset reports expose organizations to unnecessary IT purchases, software audits, and security breaches. 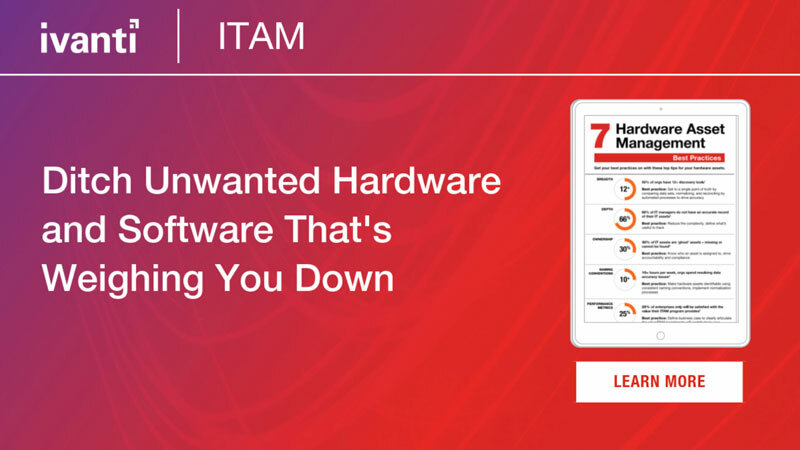 ITAM best practices include processes that map IT assets to their contractual and financial information which enables organizations to track the overall cost associated with each IT asset. With ITAM, IT assets are tracked from purchase to disposal which is referred to as IT asset lifecycle management. Lifecycle management ensures that when hardware is refreshed, software licenses are properly harvested from decommissioned devices, so they can be redeployed to new devices. Integration gives administrators the ability to see and manage all IT assets from a single solution. Without integration, asset administrators would have to use additional tools, such as spreadsheets to obtain and maintain accurate inventory information. Automation reduces human error. Mistakes can lead to inaccurate inventory information which increases risk and costs associated with IT assets. ITAM solutions often use automation tools for asset requests. UEM and ITAM are important to any organization heavily dependent on technology to achieve business objectives. UEM simplifies endpoint management with a single interface while ITAM reduces IT asset costs by keeping decision-makers informed. Furthermore, both UEM and ITAM are critical for those organizations trying to achieve digital transformation.